Retirement is a special time in the lives of many people who are coming to the end of their work career. During this time, they feel a sense of accomplishment, pride and joy at the prospect of spending their days enjoying their work-free lives. Many choose this time of rest to reflect on their lives, catch up with family and friends and tackle new projects. Other retirees choose to travel the world, explore new places, take classes and pursue hobbies. Yet another group decides to take on part time work in their spare time. It is customary to throw a party in honor of the new retiree. This party may be formal, taking place in a rented hall, complete with a catered meal, upscale décor and formal dress. In some cases, the retirement party is a small intimate gathering of close friends, family members and workplace acquaintances. Retirement parties are often held as backyard barbecues, at golf clubs, or in restaurants. Still others are held off-site as destination parties on cruise ships, at resorts or in posh hotels. Whatever method you choose for your retiree’s celebration, choosing the right invitation is the first step in making your party a success. The invitation you choose should reflect the theme, atmosphere and formality of the event. Selecting the right invitation is no easy task, but there is plenty of information available to assist you with your choice. The formal retirement party requires a unique invitation that reflects the formality of the event. This invitation should be sent out approximately 4-6 weeks prior to the event and should specify the dress for the party. The paper you choose will be the first indication to your guests that this a formal event. There are several types of paper you can choose from for your formal party invitation. Linen – Linen is a cotton fiber paper that has a textured feel. Linen is heavier than regular cotton paper, and is somewhat more expensive. Linen has the distinction of being dye-able, so you can tint the paper to match the theme colors of your event. Linen is one of the highest quality papers you can purchase and will signal to your guests that yours is an elegant and classy affair. Cotton – Cotton is another good choice for your formal retirement party invitations. Although less expensive than linen paper, cotton is a higher quality paper that will match your formal décor. The cotton fiber paper has a smooth feel, and gives off a bright white brilliance. When paired with contrasting colors, the white cotton invitation looks very elegant and classy. Parchment – Parchment is a thin, see through paper that is usually layered over a larger card stock invitation for a very elegant look. Parchment is excellent when used with calligraphy or embossing and is very beautiful. Many people attach parchment to their invitations with a ribbon or other accoutrement, and it is a popular choice for afternoon or evening affairs. Many people choose to stick with basic white for their formal invitations. However, colors like cream, bone and ecru reflect a degree of distinction and class when it comes to the formal invitation. Choose a border for your invitation that contrasts with the paper’s color, such as navy blue, gold, silver or ivory. When using a colored invitation, make sure the color matches the formality of the paper you have chosen. Darker hues usually complement the most formal style of invitation, while more vibrant reds, oranges and greens are best paired with informal or casual invitation styles. Choosing the paper for your informal invitation does not have to be a difficult process. For your backyard barbecue of intimate gathering of friends, an inexpensive, informal invite will do the trick. Cardstock – Cardstock is a thicker, corrugated paper that allows for easy printing of your retirement party invitation. Cardstock can support any type of ink, and comes in a number of colors and styles. Cardstock can be used when printing your own invitations on a desktop computer as well, saving you time and money. To add your own customized watermark for your invitation, choose a moiré cardstock to complement your invite. Handmade – Handmade papers are becoming increasingly popular for informal parties. Handmade papers are derived from recycled fibers and blended together for a natural look. Because of the texture of handmade paper, these invitations must be printed by hand, and are usually reserved for smaller gatherings. E-vites – The latest craze in invitation sending is the e-vite, or electronic invitation. These invitations are designed online and sent via email to the invited recipients. Invitees can accept or decline your invitation electronically, giving you instant information about who will be attending your event. These invitations are extremely informal, and should not be used for formal or semi-formal events. Some party planners choose to send save the date notices by e-vite, and then follow up with a mailed invitation. Invitations for your informal retirement party should be sent out with enough time to allow for responses by mail and by phone. Ideally, guests should be given 4-6 weeks notice in order to account for other social obligations and to purchase gifts, if necessary for your party. Invitations should be hand addressed, particularly in the case of the formal invitation. 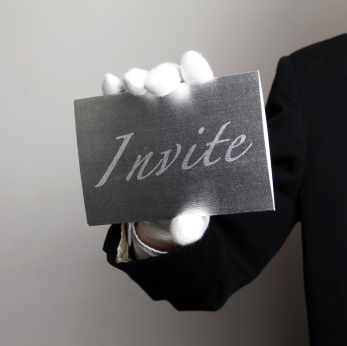 Hand addressing your informal invite is a nice touch, but not always necessary. The invitation should include a self-stamped response card, and a date by which their response is requested. The wording for your invitation will depend on the formality of your event. Formal invitations should reflect the tone of the event, while the informal invitation allows for some creative freedom. Join us as we send John off to the beach! The wording of your retirement party invitation is completely up to you, but should reflect the formality of the event. You wouldn’t want guests to show up at your backyard barbeque in a tuxedo, or wear their best Hawaiian shirts to your black tie only gala. Feel free to include a poem that has sentimental meaning to your retiree, or add a bit of humor to your informal invitation. Many party planners choose to hire someone to compose a special message to include in their invitations. Finding the right invitation style for your retirement party can be a simple process if you take into consideration all of the factors that choosing the right invitation requires. Remember to select the right quality of paper for your level of formality, choose complimentary colors and structure the wording to reflect the tone of the event. When picking the right invitation, choose something that will send your retiree off in style.